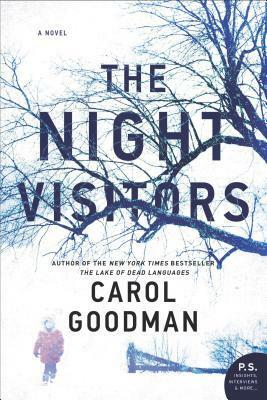 Every once in a while I’ll take a break from my sci-fi and fantasy and satisfy my craving for a good thriller, so when I saw The Night Visitors by Carol Goodman and took in its synopsis and cover, I thought it would be perfect. You see, I have something of a weakness for snowbound thrillers. And for a while, things were going great and I thought I’d found another gem on my hands. Regrettably though, that was until the second half, when the story’s carefully constructed premise started falling apart with too many absurd twists and coincidences. There’s also a paranormal aspect, which I’m usually all for, except I didn’t feel it worked quite as well here. The story opens late at night in a bus station, following Alice as she places a frantic phone call to a social services hotline requesting help to get her away from an abusive relationship. Traveling with her is ten-year-old Oren, whom Alice is desperate to protect. She tells the woman on the other end that she needs to go somewhere no one can find her, and receives instructions to go to Delphi, New York, where Alice is assured someone will be meeting her and her boy. Enter Mattie, a fifty-something social worker whom the hotline calls to do the late-night pickup. With a winter storm rolling in, however, the original plan to bring Alice and Oren to a local shelter had to be abandoned. Instead, Mattie breaks protocol in favor of safety and brings them to her house in the middle of the woods where she lives alone. It is also the house her parents used to own, before they died along with Mattie’s little brother, who was the same age as Oren at the time, to accidental carbon monoxide poisoning. Or that’s what Mattie tells people, anyway. The truth is a lot more complicated, but she doesn’t need anyone digging into her past. As it turns out though, Mattie’s not the only one keeping secrets. Alice herself is hiding a few of her own, and she hasn’t been entirely truthful to the social worker about what she’s running away from. Lately, she’s also been noticing something strange about Oren. Somehow, he seems to sense or know things before they happen, but as much as it scares her, Alice is reluctant to tell anyone for fear they’ll take the boy away from her. I’ll give The Night Visitors this—I reviewed the audiobook and it was a quick listen; at no time was my listening bogged down by any lulls or boring bits. That said though, part of the problem was the utter craziness that happens in the second half of the novel, when the plot practically implodes on itself and the author completely drops the ball on the ending. The beginning on the other hand was interesting and suspenseful, slowly teasing the mystery as we alternated between Alice and Mattie’s POVs. As the story unfolded, it became clear that not all was at it seemed. In the end, I don’t know what I expected. Perhaps, with all the characters’ lies being so carefully and methodically revealed, I had thought we would get a more complex and satisfying conclusion. Instead, all that build-up led to very little payoff, with an ending that felt brute-forced and trite. Also, normally I’d say a bit of paranormal activity spices up a good thriller. Not so much in this case. Again, it was an element that felt awkwardly shoehorned in and doesn’t feel organically connected to the rest of the plot. As well, I found it difficult to get feel enthusiastic about the idea because its implementation came across as lazy and didn’t seem all that well developed. Needless to say, if you’re looking for any answers or clarity, I wouldn’t hold your breath. Finally, I had a hard time getting into any of the characters. A part of me understands that these kinds of thrillers and unlikeable characters usually go hand in hand, but at the same time, there’s only so much nastiness, ignorance, smugness, virtue signaling or judgmental self-righteousness I can take. That said though, I can appreciate how every character in this book is a flawed and unique individual. As the novel endeavors to point out, there is good and bad in everyone, and sadly, some people who have been hurt and damaged in the past end up going on to hurt and damage others. Ultimately, this story is about Alice and Mattie both trying to break this vicious cycle by learning to open their hearts to each other—and in the end, that’s a message I can get behind. And quite honestly, The Night Visitors wasn’t all bad. I loved every moment early on as the story was meticulously laying down its foundations, but simply wished the second half hadn’t spiraled out of control the way it did. It’s passable if all you’re looking for is a standard thriller, but I just expected more from its early potential. Audiobook Comments: Jane Oppenheimer did a perfectly fine job narrating, but the audiobook could have been improved with a second narrator. Not only would it have been less confusing when the story switched between the POVs, I think a narrator who sounded older would have been better suited to read Mattie’s chapters. Well Mogsy this is an excellent review for a book that let you down. I hate it too when author add too many convenient twists. Sometimes it make us think : ” well duh! Of course, why not? ” add some sarcastic tone here. I am not against dome PNR element in contemporary book but it has to make sense as in be essantial and evident for the story. I am only beginning to listen to audiobook but I too do think when you have different POV they should have different narrators or it gets either confusing either a little bit ridicule. Exactly! I don’t think the issues would have bothered me so much if they were set up well, but they just weren’t – it all felt too random. And yes, when it comes to audiobooks with multiple POVs (especially first person) it usually pays to spring for more than one narrator! Oh no. I had high hopes for this one because you know I love a good snowy setting. In fact, it’s one of the reasons I’m really enjoying “The Hunting Party” right now. I won a copy of this off Goodreads so at least if I don’t love it, I’m not out anything. Yeah, I won’t lie, it was the snowy setting that called to me. I am going to have to check out The Hunting Party now, it sounds promising! This is why I’m a little hesitant when it comes to thrillers. In a way I feel like they’re the hardest genre to get right. Yeah, hopefully my next thriller will be better! Ooh I was wondering about this one. Good to know. My biggest issue is sometimes that very lack of clarity. I don’t mind a little ambiguity or something left to my imagination but to much of that is definitely not a good thing! I do like a little closure or explanation. If an author can pull it off, some ambiguity can be great – like C.J. Tudor’s The Hiding Place, for example. But if the execution is clumsy, man, it can ruin the entire book! Appreciate your thoughts on this one. Sorry it didn’t work out! From your description it would seem that this story moved on the unstable border between pure thriller and paranormal story, and sometimes it’s difficult to successfully juggle two genres, but I think the biggest problem would be in what sounds like a hurried, contrived ending after such a careful buildup. I’m sorry that you ended up being so disappointed! I’m so sorry! Maybe it’ll work better for you! Well that is a shame. I also like a good thriller but I rarely know which one to choose and so tend to stay reluctant about requesting them. I used to think you can’t go wrong with a thriller – that they’re all going to be entertaining to a certain degree. Boy, I was wrong about that! I was interested when I saw Goodman’s name. I read some of her supernatural romance novels last year and enjoyed them. But snowbound thriller is not my jam. I don’t want to think about being stuck in snow or in the cold or trapped by a snowstorm. Can I ask you a question about audiobooks?.. I’m just getting started with them and would really appreciate hearing a couple of recommendations from you; especially regarding good narrators. (I’m enjoying John Lee’s reading of Mieville’s ‘The City and the City’ at the moment.) Thank you. I hate it when a good book goes a bit mad at the end. Stephen King seems to do that a lot these days and it is offputting! Yeah he’s so iffy with endings! You just never know!